Posted on November 9, 2016 by Rebecca C.
November generally signifies the beginning of the holiday season. No matter how you celebrate, the holidays can be stressful. Normal schedules instantly over fill with holiday activities, extra school events, party invites and family obligations. During all the hustle and bustle, focusing on the fun part of the festivities may seem difficult. Consider creating a gratitude journal. Basically, a gratitude journal is a diary. Unlike normal diaries, the gratitude journal focuses primarily on the positive aspects of each day. Even the most chaotic, stressful days have a positive moment. Being thankful and focusing on the special moments can help ease the stressful days. The gratitude journal does not have to be anything fancy. A simple spiral bound notebook or composition notebook will work. Other types and styles of journals are available. Pick one to inspire your journal writing time. As you begin to order holiday gifts online add one to your cart. Or get creative; make your gratitude journal into a cherished memento. Later on in life, you may find the entries funny, heartwarming or unbelievable. One of the most important aspects to consider in keeping a gratitude journal is making the time to write. Getting into the habit of writing journal entries may seem difficult in the beginning. After a few days, the urge to write may surprise you. Remember there is no right or wrong way to keep a gratitude journal. Focusing on the positives may help reduce the stress of the holiday season. Many people decide to keep the gratitude journal just for the month of November or just the week leading up to the Thanksgiving holiday. Other people decide to keep the gratitude journal throughout the entire holiday season right into the New Year. Some find the journal entries inspiring and decide to continue. The length of time depends on your personal desire. Posted on December 4, 2015 by Rebecca C.
Did you know there’s an official day for making out Santa’s list? Today, December 4, 2015, is Santa’s List Day. The interpretation of the unofficial holiday varies from site to site. One way to view, Santa’s List Day is to imagine him sitting at his large, old oak desk at the North Pole. Do you the image in mind, yet? Picture the newly fallen snow blanketing the entire area around Santa’s workshop and the reindeer stables. Better image? Now, imagine him picking up a magical white feathered quill to makes his list of who has been naughty and nice. As he writes out a name, the ink will glow Christmas green for nice or a candy cane red for naughty. Most years, the Christmas green is overpowering the red. Where will you name be? Another way to view Santa’s List Day is to make your own Christmas wish list. If you could get any wish this Christmas, what would you ask Santa for? Mine….peace for all mankind. I think the world needs a little Santa magic. Did you make out Christmas lists as a child? I did. To this day, I believe in the wonderful magic on the holiday season. My childhood Santa list usually consisted of toys, a horse and a goat. I know what a combination to ask from Santa. Well, I usually did get a couple of toys from the list. We would also receive new clothes. I never did get the pony or the goat. Of course as an adult, I can understand why that wish was never fulfilled. If you have children, I think Santa’s List Day could be a fun addition to your holiday season. Prepare the lists together. Of course if you are anything like my mom, she started her Christmas shopping months in advance. (She still does, well we both do now). I think making Christmas list could be a family fun project. You could be as simple as using a piece of paper and pen. Or you could make an entire art project out of the day. I think the most important part is the time spent interacting with your family. Posted on December 25, 2014 December 25, 2014 by Rebecca C.
The camera always pans over the crowd to the beautiful artwork and statues of the cathedral. There’s the use of all the diverse languages from around the world; I always wanted to learn Latin which is used often in the mass. I really do not know what all the ceremony and symbolism represents; I am going to have to research the process one of these days. I just find the entire setting beautiful. I also like the element of historical symbolism that is presented in the mass. The Book of the Gospel which was placed by the statue of the baby Jesus was a replica of the one from 1506. The history in the walls of the Vatican and Rome would be amazing to know and study. The message I got from listening to the Pope was the fact, “the world needs tenderness”. I agree with this statement from him. I think the world could use more tenderness, good will toward fellow man so to speak. I spent most of today, Christmas Day with my family. I brought my 95 year old great aunt out to the family gathering. If you really want to learn about people, you should talk to someone who has been around for as long as her. She always shares stories of time past; the best learning experience anyone could ask to receive. She also provides insight; we often go through life thinking we shouldn’t do certain things. We hold back in telling people how we feel out of fear of rejection. Or we fail to try something new because we think we are too old to learn. But wouldn’t you rather look back when you are 95 and say, “wow, I can’t believe I did that” than say “I should have done that when I had the chance”. Life changes so quickly. Be with the ones you love and show no fear. Try zip-lining, mountain climbing, a new class or anything else that makes your heart sing. 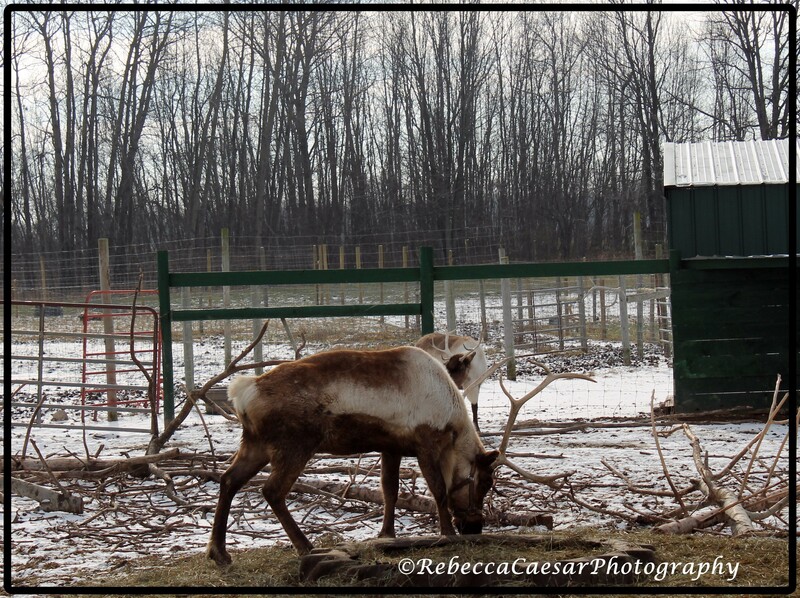 Posted on December 2, 2014 by Rebecca C.
Over the weekend, I was fortunate enough to visit the Rooftop Landing Reindeer Farm. Growing up on a farm, I love animals, I had never seen a reindeer up close. The trip to Clare, Michigan was worth the extra miles. The Reindeer Farm is great for photo opportunities especially if you have children. You can even get your photo done professional right there in the little gift shop area. 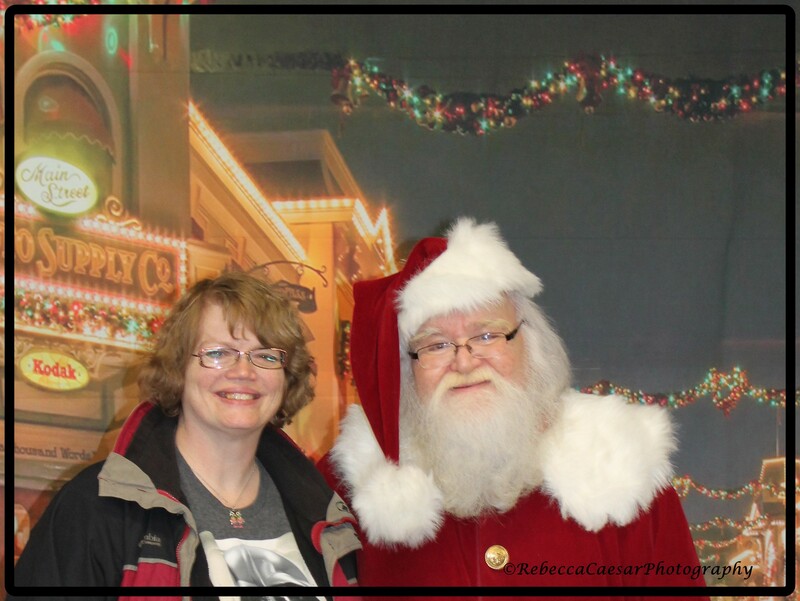 I was able to get my photo taken with Santa. There was no cost, you just had to use your own camera. (please ignore my hair, the day was windy). I went on a small wagon ride. 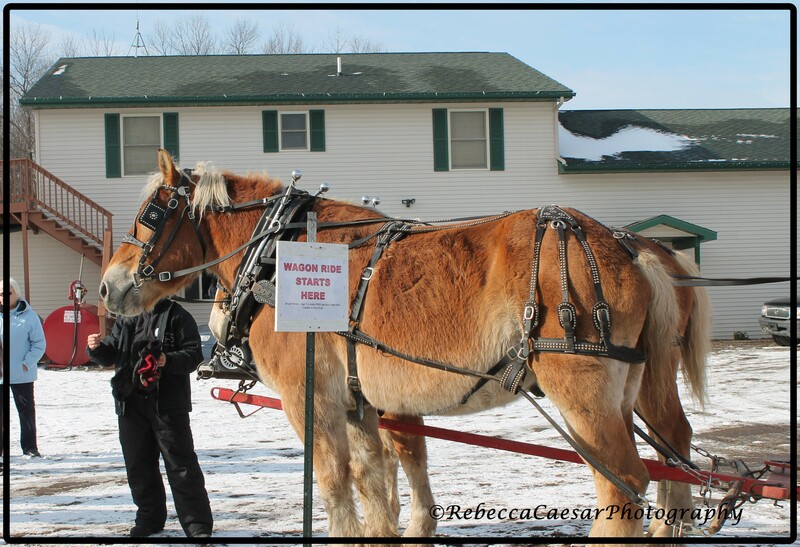 During the ride, I get to hear the story of Rex and Harley, the two Belgium horses who pulled the wagon. Rex and Harley were rescue animals who were abused. The two beautiful horses will pull the wagon for another season before being put into retirement. Hearing the story and the amount of work the couple put into their horse ranch/farm made paying for the wagon ride a small gesture. (The couple keeps all the proceeds from the rides). 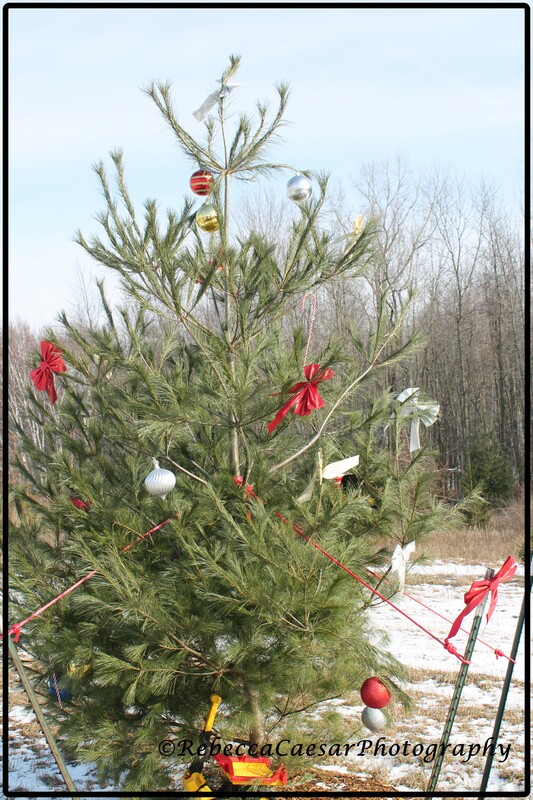 On the wagon trail, a tree was decorated which created excitement for the children on the ride. I also loved the mom singing Christmas carols to her son as we went through the wooded area. The little boy who I would guess was around three years old seemed a little apprehensive on the wagon being pulled by two huge horses. The singing from his mother made him smile. The area where you could view these magnificent reindeer had signs filled with information and facts. I would recommend this little farm experience for all those who are in the area of Clare, Michigan especially if you have small children. Posted on December 2, 2014 December 2, 2014 by Rebecca C.
For many Black Friday, entailed early morning shopping. I slept in. I had actually gone shopping on Thanksgiving night; my mom begged me to take her. Of course, I spent most of my time hiding down an aisle while my mom and niece searched for bargains. I am just not a fan of the chaos and the crowds. 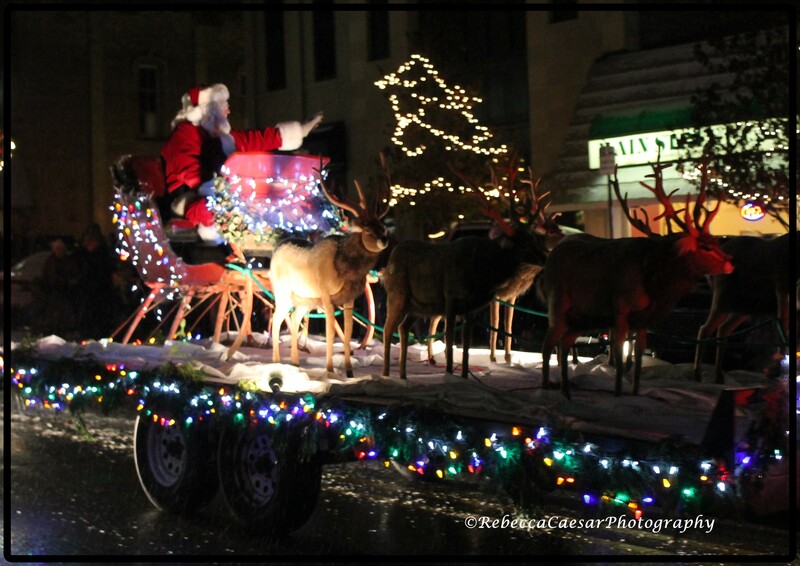 Later in the evening on Friday, November 28th, I actually took time and went to the Light Parade in St. Johns, Michigan. The little parade was fun; the cold not so much. The snow did give the whole event an extra Christmas touch. I really haven’t found my Christmas spirit yet. I am not sure why, I usually have my tee up by now. So, I have decided to attend local events in hopes of finding my Christmas spirit. I thought I would share them with all of you. 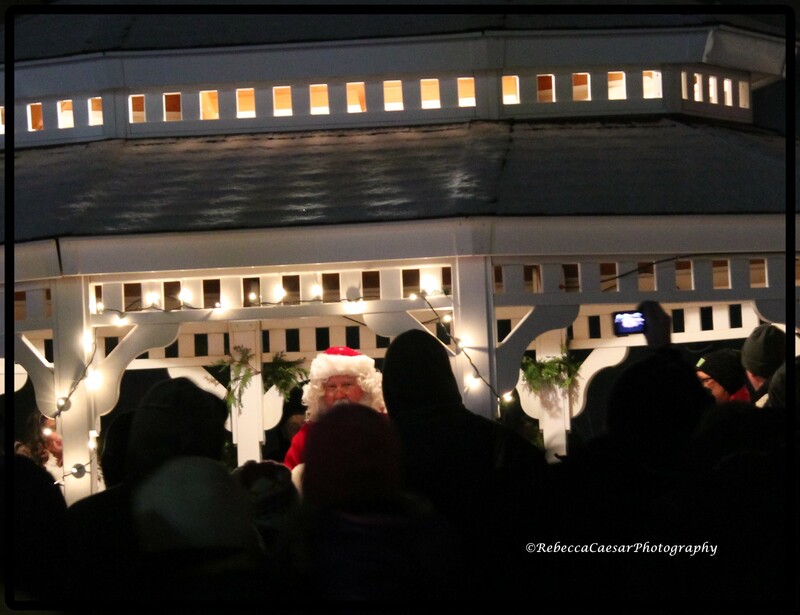 Of course, the man of the hour: Santa Claus makes his way down to the train depot. Santa gets the key to the city to be able to deliver all the toys to the good boys and girls of the town. After all the key was presented, the Little Miss Mint officially started the holiday season by lighting the Christmas tree.